With the late-2008 introduction of the "unibody" MacBook and MacBook Pro, Apple introduced a new video protocol - Mini DisplayPort. 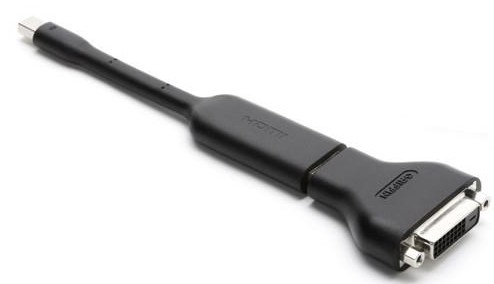 A more compact form of its DisplayPort connector, Mini DisplayPort (or Mini DP) allows monitors, projectors and other external displays to show images at resolutions of up to 1920 X 1200. Our Video Display Converter is a two-in-one solution to convert Mini DisplayPort video output to two high-definition formats - DVI (Digital Visual Interface) and HDMI (High-Definition Media Interface). Use with your existing cabling to convert the Mini DP signal to HDMI or single-link DVI and enjoy your MacBook or Macbook Pro's video in high resolution on the big screen.